When a dog was found in a horrendous condition on the side of the road, no one believed he would survive - and now, he's getting the best happy ending that anyone could ask for. 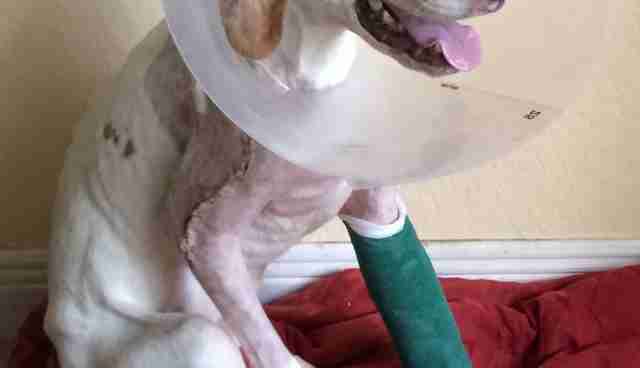 Robinson, a 2-year-old white hound mix, was found with two broken legs and was so thin he was basically skin and bones. It was suspected that he had either been hit by a car ... or with some sort of blunt object. Either way, the poor puppy was likely abused, and his luck didn't seem to improve when he was found. 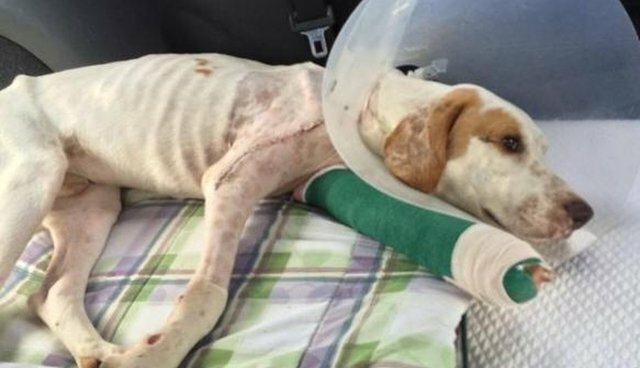 Robinson was taken to the Levy County Animal Shelter in Florida, where he was slated to be euthanized due to his immense injuries. 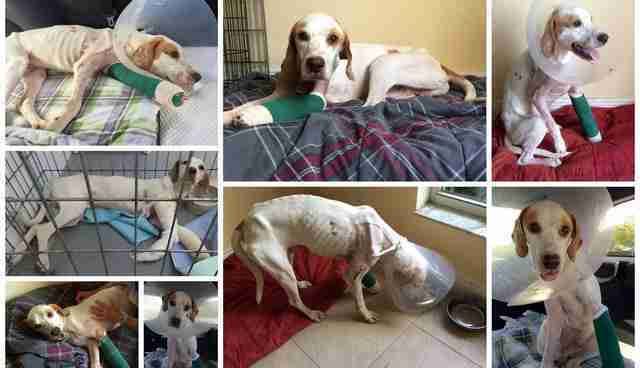 The poor dog was so emaciated that he could barely sit up ... and yet through his pain he never stopped wagging his tail. The shelter staff knew that this puppy was something special - and absolutely needed to be saved. With the help of both Friends of Levy County's Homeless Pets and PAWS Rescue, Robinson was given a second chance at life. 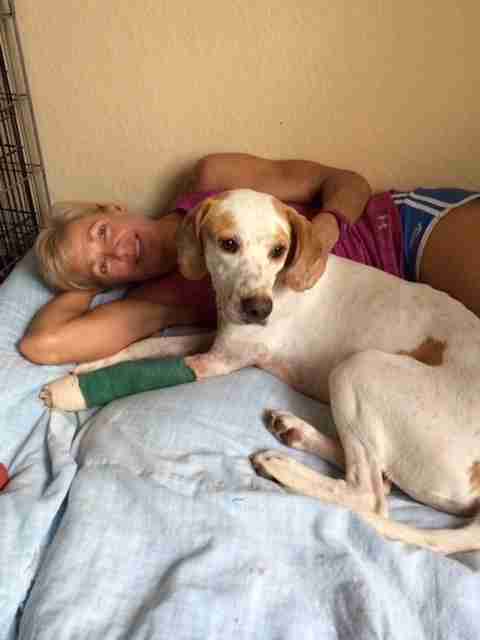 He underwent surgery to repair his legs and slowly began to heal, both physically and emotionally. "He gets excited to go for a walk on the leash, but noises scare him during the walk," Inga Martinez, a volunteer with PAWS Rescue, told The Dodo. "I am working with him and hope in time it will improve." 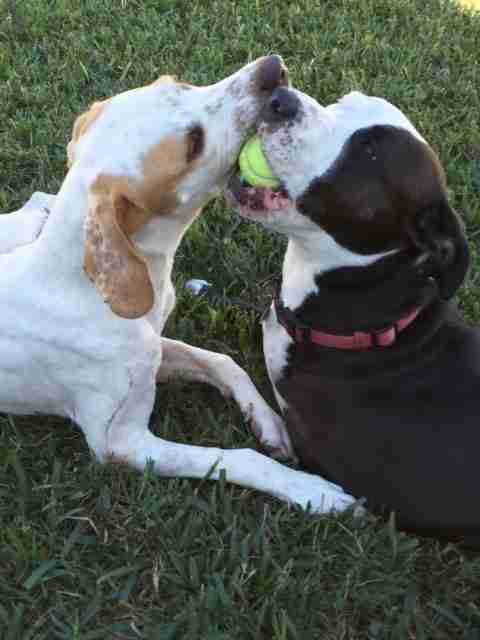 During his time with PAWS Rescue, Robinson grew very close to Martinez and her own rescue dog, Mila, a three-legged pit bull who was also saved by PAWS Rescue years ago. Martinez and Mila were essential to Robinson's healing process, and helped to show him that the world isn't such a scary place after all. "He gets spooked easily by all kinds of things, but is learning from Mila that he doesn't need to be afraid," Martinez said. 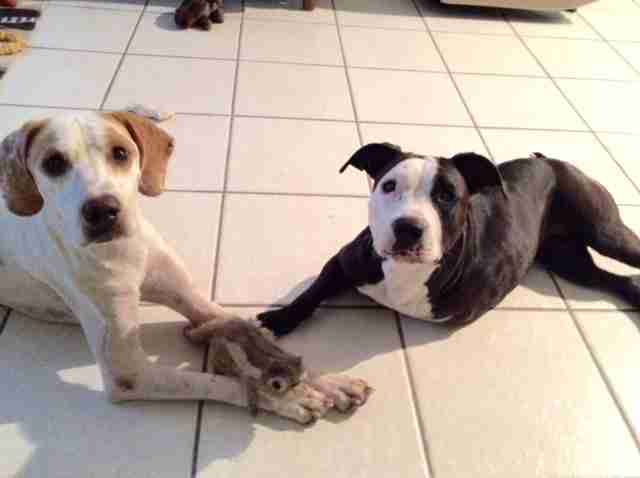 Now, almost three months after he was rescued, Robinson is finally healed and ready to go to his new forever home - with his best friends, Martinez and Mila! What's more, the adoption is happening on Christmas Eve, meaning Robinson gets a loving home just in time for the holidays. 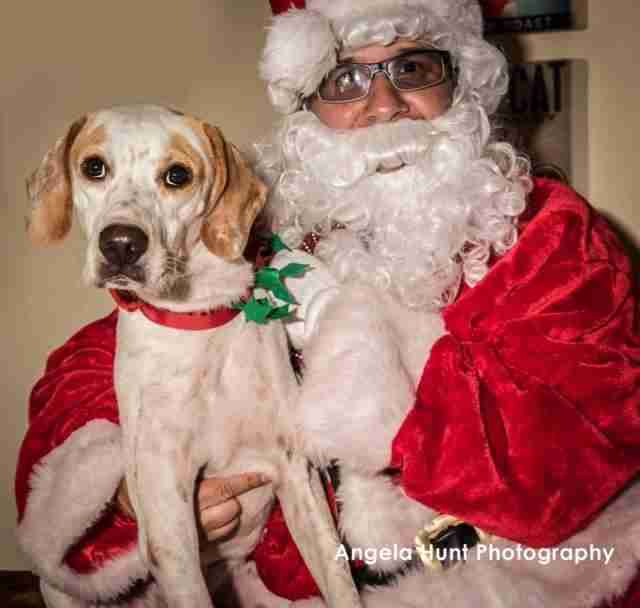 When Robinson was first rescued, it didn't seem like there was much hope for him, but he never gave up, and now thanks to a little hope and a lot of love, Robinson is getting his Christmas wish - to have a loving home and never have a reason to be afraid ever again. As volunteer Karen Altieri put it, "Yes, Robinson, there is a Santa Claus."